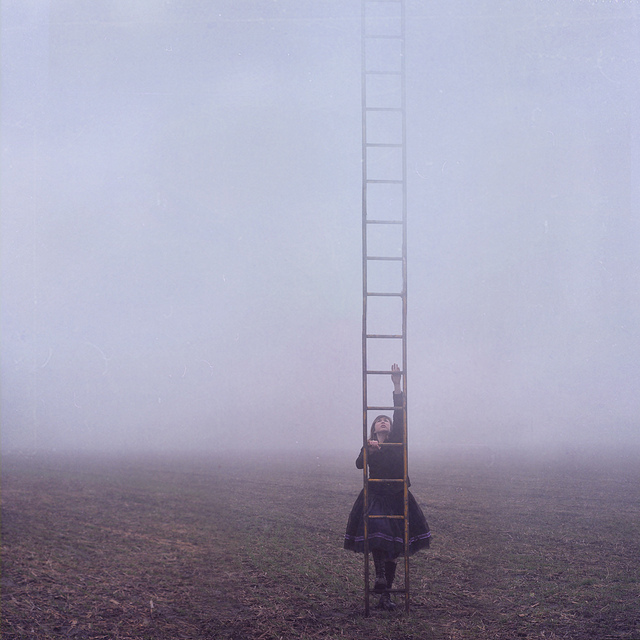 On waking, she found a ladder standing next to her, its top disappearing into the fog above. Looking to the left and right to make sure no one was looking at her being so mischievous, she began to ascend. Halfway up the ladder got all oily, and it was hard to keep going. She began to think, “oh, but what if it’s no good up there either? Maybe it’s just a boring old place too.” But, given that she hadn’t been able to find anything below for so long, she decided to power through, and even though it took a great deal of strength, she passed the oily area and kept ascending into the clouds. No sooner had she begun to think about how long the ladder was than her head popped through the clouds, and she could see the bright blue sky above her. She was curious, but still sad. But since she had nothing better to do, she started to wander around the clouds. It wasn’t too long before her sad, wandering eyes, met with the sight of a giant stirring something in a large pot. It smelled bland. The girl took out a small notebook from her pocket and handed it to the giant, who couldn’t flip it open with his giant fingers. “Well I’ll leave you to it,” he said after trying several times to open the notebook and failing. “Just making some soup.” said the giant. Just then, the girl noticed that the giant’s pot was sitting on what looked like a large, red frog, who was getting redder by the second, and looked angry. “Don’t overheat it now,” said the giant. He tapped the frog with a stick and all the hot air blew out of him, and he returned to a gray color. “Who’s he?” said the girl. “Oh, I see,” said the girl, and she wandered around the giant’s outdoor kitchen quite confidently, eventually walking right up to the angry face of the frog, and poking its nose. “So what makes YOU so angry?” she said. At this the frog puffed up with anger. “Best not do that,” warned the giant. The frog rolled his eyes, breathed out, and returned to normal. A smile lit up the girl’s face. “This is funny!” said the girl, jumping towards the frog. “Easy does it,” said the giant. He put his hand between the two of them and nudged her back. “Well… fine.” said the girl, mirroring the frown in the frog’s face. She began to pace around the giant’s home-with-no-walls, kicking wisps of cloud as she went. She went and sat on the bed and brooded. Just then, the sky began to darken. Dark clouds moved in far above them (a fact the girl found surprising), and thunder could be heard in the distance. The girl got concerned and complained to the giant, but he sat calmly eating his soup as he answered her. This did not comfort the little girl at all, and she kept wandering around clutching and the table’s legs, which were as wide as trees. Soon after, a man riding a black horse drew near. The girl hid behind the giant in fright, for the horse and its rider were just as big as the giant, and the rider wore a helmet of twisted metal, which frightened her even more. “It’s time.” said the man on the black horse. “Time for what?” said the giant calmly. “Leave your smart words for someone who will show you mercy,” said the man. He grabbed the giant’s shirt threateningly. Her blood ran cold, however, when the horseman turned to look at her, face hidden beneath the metal helmet. He reached out a gauntlet-covered hand towards her, but the giant blocked it. But whatever else the man was going to say was lost when the giant took the opportunity to slam his fist into the man’s exposed head. The man went flying, but was able to stand after a short time. Just then the frog blew out a jet of flames, scaring the man away. “I didn’t know he could do that,” said the girl. “He is useful for many things,” said the giant, and sat back down to dinner. The girl still felt nervous. The girl was not so sure, and went to sleep uneasy. When she awoke, the giant was already up, putting logs away in his kitchen. Where he got the wood from she could never guess, but didn’t ask the giant about that, because she what she saw was that the entire cloud area around the giant’s cabin-without-walls had fallen away. She crawled to the edge and could see the green earth far beneath them. With a squeak she ran away from it. “What’s going on?” she said to the giant. “I don’t know,” said the giant, calm as ever. The frog had to keep breathing rapidly though, because he kept getting angry fast. “The ladder… but, but, I can’t go down now! You’re in trouble here, and, well, what good could I do down there.” She began to get very nervous. Just then she noticed, out of the corner of her eye, a dignified looking man approaching. As he did, a small bridge of clouds formed. He was normal human-sized, and looked quite small to the girl. The man, who had a well-greased, tiny mustache, pulled open a large piece of parchment. “What is my offense?” said the giant calmly. “You will find out when you get there,” said the man, who looked severely annoyed. “I don’t like him,” said the girl. The giant just shrugged his shoulders, and began to pack his things into a bag, including the frog. “I’m going with you!” said the girl. They started off along the clouds, the girl grumbling to herself all the while. She didn’t like the situation at all, nor how the giant just went along with it. He could have easily just thrown that messenger off the clouds. Before long, they reached the castle in the clouds, which was a tall white castle that nevertheless had a swirling black cloud around it. The girl didn’t like the look of it at all. As they walked through the city, the residents all looked at the pair with suspicion, and even resentment. But why would they care? Was the giant really all that bad? She and the giant reached the entrance to the castle, and were asked to wait while the heavy marble doors were opened by twelve tiny men. Stepping inside, they caught sight of the larger people living inside. One of them, standing next to the throne, began jumping up and down, pointing at the pair who had just entered. “That’s them! That’s them! Damn them!” It was the man from before, and, the girl noted, he looked excited. The king remained unmoved, looking at them as dispassionately as if they were rocks, a look of intense dissatisfaction on his face. He was dressed all in metal, with a red and black velvet cape that stood in contrast to his white throne. He finally stopped leaning on his fist in order to pick his nose. “You there,” he said, flicking his booger then pointing to the men standing behind the giant and the girl, “close the doors.” He turned his attention to the giant. “Would you mind telling me what they are?” said the giant. “You tell him.” said the king to the messenger from before. “Oh – yes, of course,” he said as he unrolled another large scroll. The king had returned to picking his nose. “And my punishment?” said the giant. The giant was silent, the girl dumbstruck. The prince now sauntered forward. She stared wide-eyed, in shock. Just then the frog burst from the bag. He started shooting flames all around the room. The response was quick. The prince picked up his black mace and sent the frog flying. Then the king drew his sword and began to approach. Then the giant pushed the king back. “No, I am the only one to die.” The girl noticed he was talking to the frog. The frog looked sad, and slunk off into the corner. “Yes, good froggy, obey your wise master,” said the prince with smirk. “Oh I wish I could just…” said the girl. Suddenly, the girl realized something. Her heart started racing. The prince raised his eyebrow at her. “Hmm? Is something wrong with you?” said the prince, snarling. The girl had seen the giant’s strength, and knew that if he would he would take out those who were trying to kill him. But having watched him submit, she knew that he stood no chance against these cruel men. She knew what she had to do. Straightaway, she marched towards the door. The frog hopped after her. “Oi, where are you going, little girl?” said the prince. “For a walk.” said the girl. The frog was glowing red hot next to her. Not daring to look back at the giant, she fled from the castle, running as fast as she could, past the curious crowds, and outside. The frog kept jumping ahead of her and sitting down. “Stop it, you stupid frog!” she shouted. Again and again he did it and soon she was doubled over, tired from running. The frog sat right in front of her again, and then she realized it was trying to get her to ride it. As soon as she climbed on, the frog turned in the direction of the castle, and a jet of flames shot out. She barely hung on as the frog rocketed backwards, and back towards the giant’s home. No sooner had she got there than she launched herself down the ladder, and, on reaching the earth (the frog just jumped down), ran to the nearby town. The villagers all looked delighted to see her. As fast as she could, she rushed into the castle, where her father, the king, was holding court. She calmed down as tears continued to roll down her cheeks. The king, silent, looked to his warriors, who were leaning against the wall, listening. “Tell us where to go.” said one. The princess took a moment, looking between the king and the warriors, then, turned and rushed out the door, only to find it blocked by the frog. “What’s that?” said the king. The princess jumped on and, looking over her shoulder, shouted, “Follow me! And clear a path!” Then the frog blew a jet of fire, and the next instant was in the town square. Soon, the princess and all the king’s warriors, who numbered a thousand strong, were ascending the ladder. The frog met them at the top, bursting through the hole in the clouds with a single hop. The girl looked desperately up at the sun and saw it was almost at its peak. She, not thinking to wait, hopped on the frog and blasted towards the castle far ahead of the fighters. The frog and the princess arrived at the castle gate. It was before noon. Instead of waiting for the twelve tiny men to open the door, she let the frog burst it open. She staggered in. “Where is he? ?” she screamed. The king, who was eating lunch, sneered at her. The princess stared in horror at the sight. The sad eye of the giant looked back at her. She couldn’t bear it any longer. The princess balled up her dress and screamed. The king looked up, horrified. It wasn’t an ordinary scream. The pitch was higher, more intense than that. The air itself began to shake. Then, the windows burst. A red glow could be seen out the window. The girl walked outside, screaming, tears falling from her eyes, as fire fell from the sky. It hit the white castle with such force that it cracked in two, then, waves upon waves of fire hitting it, crumbled to the ground. The cruel king and all his court were buried with it, but the giant’s head stood on a pole above the debris. The townspeople and the warriors who had just arrived all stood dumbfounded. Just then, the girl spotted a small gold ring on the ground. She calmed down for a moment, picked it up, put it on, and began to hear a voice. She turned around and saw the giant’s head talking. The ash in the air and everything else, however, was frozen in time. The girl, weak as she was, couldn’t lift the pole out of the ground. So she took the ring off and called some of the warriors to her. Leaving the giant, she went over to the large mound of debris where the giant’s body was, and dug it out as if in a daze. The warriors helped her, but said nothing. Soon they sat the body up and removed the pole from the giant’s head as the princess requested. They placed the head on the body and nothing happened, so she put on the ring again. “Isn’t this what I needed to do?” she asked. “It’s kind of difficult to reattach so quickly, you know?” said the giant. “But I think now I can do it.” And just like that the head was reattached to the body. “It’s ok now,” the giant assured her. So she took it off. No sooner had she done so than the giant’s body lifted up in the air, limp, then touched slowly down to earth again. He started breathing slowly. The frog, who had been standing nearby, jumped towards his master with a hopeful look in his eyes. “Well, I guess I’ll have to make due with one eye from now on. Don’t suppose I could find it. The girl was so excited, with a huge smile on her face, that she barely noticed when an eyeball shot out of the rubble and into the giant’s eye socket. “What – of all the – that…” he looked around, surveying all who were looking at him. “Who are you?” he said to the warriors. “Yes, I thought you might.” he looked over at the girl, who was still staring at him, now with a look of disbelief. “Thank you.” he said with a smile. “That’s no matter,” he said gently. The princess smiled. The giant, along with his frog, returned to his cabin-without-walls, even though the princess tried to convince him to move to her city – for the giant was content to live at his home. However, from that day forward, the giant was welcomed in the princess’ town, and he was often consulted by the king. The princess, too, visited the giant whenever she could, climbing the ladder, probably to this day, to visit the giant where he resided. And the two of them kept the secret of the princess’s voice, and the power of the golden ring, hidden from the rest of the world.